Stu asked, "What is it, Jo? What is it you're searching for?" Jo's reply: "Tomorrow. And I can't wait." 1941: After being canceled by the network, NBC Radio aired what was intended to be the final episode of radio soap opera The Guiding Light. The network received 75,000 protest letters and the show returned 11 weeks later on March 16, 1942, running for four and a half more years on NBC Radio before being canceled again. CBS Radio picked up the show in 1947 and the series ran on radio and television (starting in 1952) until September 18, 2009. Note: There are conflicting sources about whether this was truly The Guiding Light's first time leaving the air. Some suggest it was also off for a time during its second season (October-December 1939). 1952: The final episode of Big Sister aired on CBS Radio. 1966: On Another World, Sam Groom debuted as Russ Matthews. Russ returned to Bay City to do his internship at Memorial Hospital. 1966: On Search for Tomorrow, Eunice (Ann Williams), Stu (Larry Haines), Marge (Melba Rae), Bob (Carl Low) and Patti (Gretchen Walther) were gathered at Jo's house for Christmas. Mary Stuart (Jo) played guitar as the girls sang "Bring a Torch, Jeanette, Isabella." Later, Jo sang "O Jesus, So Sweet." 1969: On Dark Shadows, Julia (Grayson Hall) played Quentin's music for Grant hoping he would regain his memory. 1980: Fred J. Scollay aired for the final time as Charley Hobson on Another World. 1983: On Another World, lovers Carl Hutchins (Charles Keating) and Felicia Gallant (Linda Dano) spent the morning in bed. 1983: On The Edge of Night, Greg Schaeffer (John O'Hurley) was not happy to hear Derek Mallory would be checking into the backgrounds of everyone at Image Inc.
1986: On All My Children, Tad Martin (Michael E. Knight) left Pine Valley. 1986: On Guiding Light, Nick continued to work his Christmas magic in Springfield. 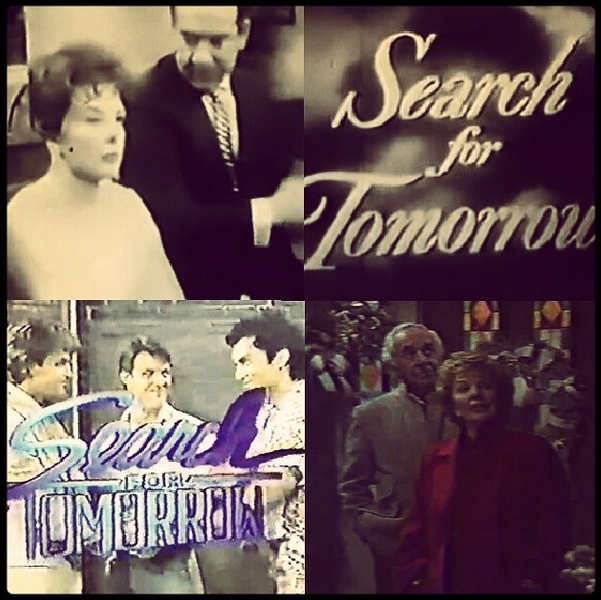 1986: The final episode of Search for Tomorrow aired after a more than 35 year run on CBS (1951-1982) and NBC (1982-1986). Read Nelson Aspen's take on the end of SFT here. Watched the beloved final scene between Stu and Jo below. 1986: On As the World Turns, Craig (Scott Bryce) asked Iva (Lisa Brown) to marry him. 1994: Actor Robert Emhardt, the original Mackenzie Cory on Another World, died at age 80. 2000: On As the World Turns, Lisa (Eileen Fulton), Kim (Kathryn Hays), Bob (Don Hastings) and Nancy (Helen Wagner) weren't really in the Christmas spirit until Chris surprised them with Penny's (Rosemary Prinz) arrival. Over at Tom and Margo's house, Lyla (Anne Sward) returned for a visit to talk Katie (Terri Conn) out of her sham marriage to Simon (Paul Leyden). 2006: Phillip Jeanmarie debuted as Vincent Clarkson on Passions. 2007: On Days of our Lives, Alice (Frances Reid) remembered Tom (Macdonald Carey) at Christmas. In the final scene ever taped by Reid, she hugged a picture of her late husband and said, "Merry Christmas, Tom." 2008: On General Hospital, Robert Scorpio (Tristan Rogers) walked Robin (Kimberly McCullough) down the aisle during her wedding to Patrick (Jason Thompson). 2012: On General Hospital, Lucy Coe (Lynn Herring) crashed the Quartermaine Christmas festivities. Thanks to Stuart for sending in the item above.